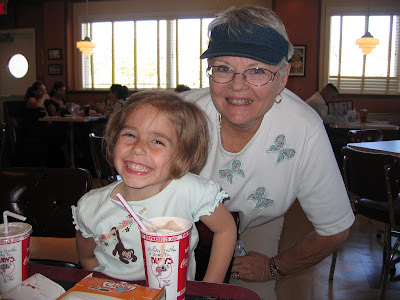 I just love this picture of Madeline and Aunt Connie at Ruby's Diner in Cabazon! Madeline was just elated to be there...and was soon to indulge in that chocolate milkshake. That always makes me smile, too! Madeline decided to dress herself this particular morning. She was upstairs for about 20 minutes and came down just bursting with delight. Notice how well everything matches! 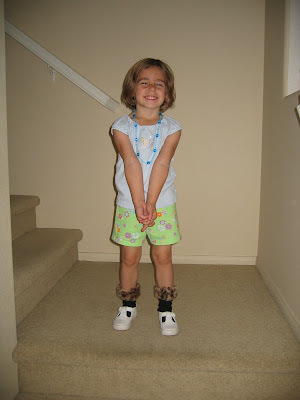 :) And she didn't forget to accessorize. That's my girl! 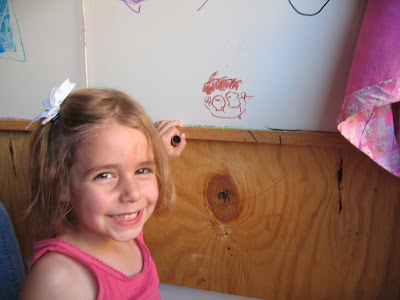 Jay and I were impressed with Madeline's representation of Gramma on the white board. She concentrated much of her energy into drawing the glasses and curly hair. I was concerned that there wasn't any nose, but that didn't seem to bother her. We had a record-breaking heat wave pass through Valencia this week. With 103 degree heat, water play was almost necessary! 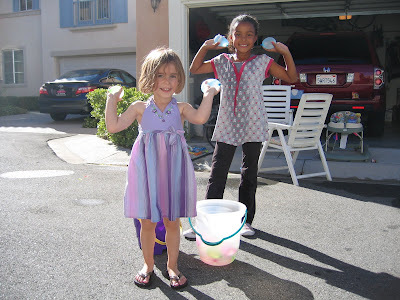 So, we had some water balloon fights and ran through the sprinkler that we set up in our cul-de-sac. 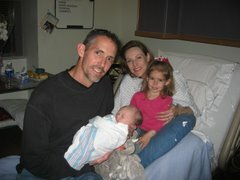 Madeline is pictured here with our friend and neighbor, Jadin.